Today is the annual United Nations International Day of Persons with Disabilities, which has included a whole slate of UN sponsored speakers and events, and a whole lot of social media activity calling attention to disability as an important identity and issue world-wide. As “day-days” go, it’s definitely a step or two above the scores of semiofficial days commemorating postage stamps, snack foods, and other trivia. This is really A Thing. The first thing that came to my mind is the status of the UN Convention on the Rights of Persons with Disabilities. The United States signed the treaty, but the Senate hasn’t ratified it, so our participation in it isn’t actually in effect. Most other countries in the world have fully ratified this disability rights treaty. The United States is in fine company balking at fully endorsing … along with Libya, Chad, Uzbekistan, Kyrgyzstan, and North Korea. A few more Senators should probably get over their bizarre superstitions about UN officials micromanaging parents’ relations with their disabled kids, and ratify the damned treaty already. The United States is the world’s leader in disability rights … it really is. It’s about the last country on Earth that should worry about disability rights being included in international law. 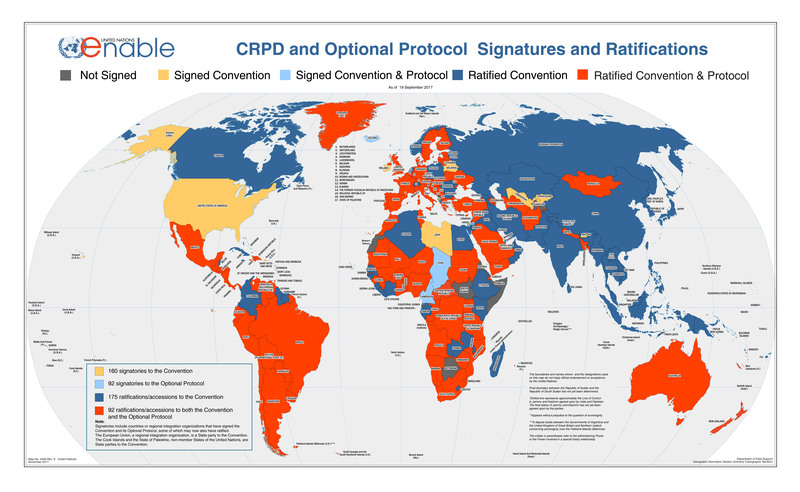 Click Here for a map showing the signatory and ratification status of all participating countries.